These are wonderful moist hits of chocolatey goodness. The fact that they are gluten-free is almost incidental, since you’d be hard pushed to spot any difference between these and standard brownies. 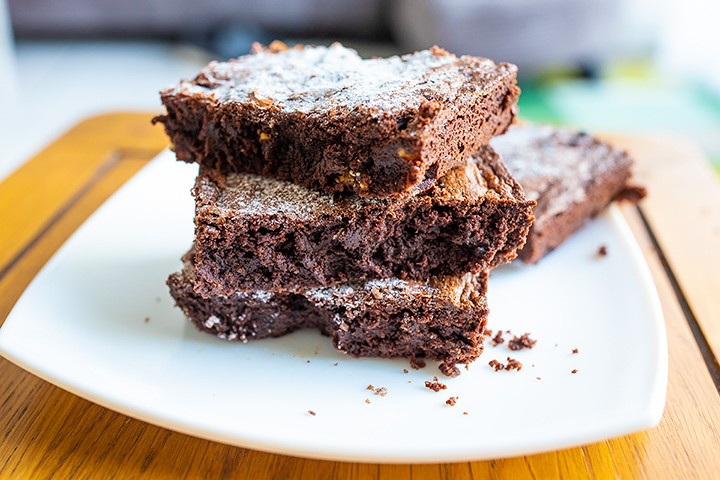 If you make brownies regularly, there’s actually no reason why you wouldn’t use this recipe and know that you can hand them round with confidence to an absurdly grateful audience. The keys to success are to make sure that you just heat the chocolate and butter enough to melt and mix thoroughly together. You don’t want to overheat it and risk making the chocolate go grainy. Secondly, make sure you whisk the eggs and sugar together for long enough. If you’re using an electric whisk, you should keep it going for 4 or 5 minutes, and if using a hand whisk about double that. Finally, when you fold the two together, do it as gently as possible so as not to knock the air out that you’ve spent so much time getting in. It’s not as delicate as a sponge cake, but you do want brownies that have a moist and melting texture, not one that is a chocolate brick. Preheat the oven to 180ºC / 160ºC fan oven, and lightly grease a tray approximately 32cm x 20cm. Separate the plain chocolate into pieces, and put in a heatproof bowl with the butter. Place over a pan of gently simmering water and leave until melted, stirring occasionally to make sure it mixes together. Take off the heat and set to one side. Whisk the eggs and the sugar together until thick, pale and at least doubled in volume. Fold the chocolate mixture into the whisked egg. Sift in the cocoa powder and the flour. Add the teaspoon of xanthan gum. Using a spatula, fold the mixture together carefully until fully mixed. Finally, gently fold in the white and milk chocolate pieces. Pour the mixture into the tray, and bake in the oven until done. You can tell it’s done by inserting a cocktail stick into the middle and have it come out mostly (but not necessarily wholly) clean. There should be no wobble in the middle when slightly shaken, and the top should be dark and shiny. Depending on your oven, should take between 20-35 minutes. When cold, carefully turn out and cut into rectangles. If you like, you can sprinkle with a little snow sugar, but they will be fine without. The brownies will keep for 4-5 days in a sealed container, a bit longer in the fridge, and can happily be frozen and defrosted to order. A boon for those of us that live alone and just want to enjoy a hit of chocolate heaven occasionally!